Drawing extensively from real-life cases, Policy Analysis as Problem Solving helps students develop the analytic skills necessary to advise government officials and nonprofit executives on a wide range of policy issues. Unlike other texts, Policy Analysis as Problem Solving employs a pragmatic, heterodox approach to the field. Whereas most texts on policy analysis are anchored in microeconomics, emphasizing economic efficiency, this book takes a broader view, using realistic examples to illustrate the full scope of policy analysis. The book provides succinct but thorough discussions of the key elements of the policy-analytic process, including problem definition, objectives and criteria, development of alternative policy options, and analysis of these alternatives. The text’s practical approach and extensive downloadable resources—which include interviews, case studies, and further readings—will be of enormous benefit to both students and instructors of policy analysis. This book is exactly what is needed, by public policy students and by faculty. It includes the breadth of analytical tools needed by the future policy analyst, within a flexible yet operative framework. By including two in-depth cases throughout the text, it also provides the instructor with the needed context to go from abstract tools to concrete, and contextually appropriate, policy advice. This important book introduces policy analysis as a means to social impact, not as an end itself. Policy Analysis as Problem Solving shows its readers how evidence can make a difference in solving important and often messy problems, but acknowledges the many ways that evidence can be assembled to make progress against what seem to be impossible goals. The book gives readers the chance to consider the many choices that lead to impact, while using real-world cases to show how policy analysis can create clarity in the midst of today's bitter disputes about the causes, consequences, and possible solutions to what often seem to be intractable problems. 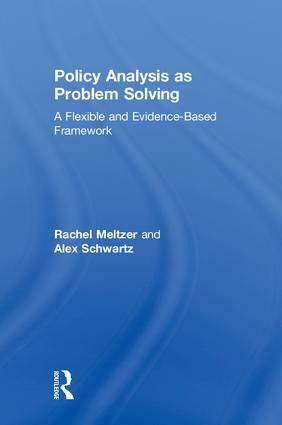 This well-written, smoothly presented book is well-designed to become the standard text for policy analysis courses for the next generation of problem solvers. This textbook provides the ideal counterpoint to the conventional rational model of policy analysis. It helps the user understand the nuanced differences between orthodox approaches that emphasize economic efficiency and heterodox approaches that embrace a wider array of criteria for evaluation of policy options and equips the reader with real-life examples that will assist in delivering balanced solutions to messy policy problems. This an innovative, well-written textbook that presents policy analysis from a more interdisciplinary perspective than other books. I connected with its view of policy analysis as "evidence-based advice-giving" and appreciated the way it integrates the latest insights from the behavioral sciences and design thinking. I believe the book will not only inspire deeper learning about policy analysis but also teach practical skills that students can take with them and actually use to help both public and nonprofit organizations make better decisions. Rachel Meltzer is Associate Professor of Urban Policy and Chair of the Public and Urban Policy master’s degree program at the New School. She regularly teaches Policy Analysis, advises student teams in the Urban Policy Lab, and runs a doctoral seminar on theories of the policy-making process. Her research is broadly concerned with urban economies and how market and policy forces can shape disparate outcomes for neighborhoods. She focuses on issues related to housing, land use, economic development, and local public finance. Alex Schwartz is Professor of Urban Policy at the New School, where he has taught Policy Analysis since 1993. He directs the New School’s Urban Policy Lab, in which teams of graduate students advise government agencies and nonprofit organizations on a wide array of policy and management issues. His research focuses primarily on housing and community development. He is the author of Housing Policy in the United States (3rd edition) (Routledge, 2014) and is the Managing Editor for North America for the international journal Housing Studies.